We have wide range of compasses. All compass are in working conditions. 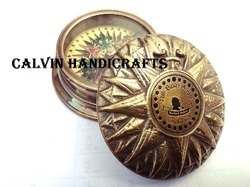 Our nautical compasses provides complete nautical flair.This Compass Size Is 5.7cm. This Is Solid Brass With A Black Finish. The Dial Is Bright, Beautiful & Is Easy To Read. The Lid Of The Compass Unscrews Under The Base & Screws On Top. Inscribed In The Inside Of The Lid Is A Poem By Robert Frost "The Road Not Taken"
Marine Brass Poem Compass, Size/diameter: 3"
मरीन पीतल का क्रीम कम्पास, साइज़ / व्यास: 3 "
Handicraft Antique Boy Scouts Poem Full Brass Nautical Compass. These wonderful key chains are also making ideal gifts for family, employees, friends, clients and other near and dear ones. 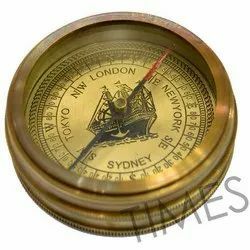 With immense market knowledge, we have been able to provide optimum quality Brass Real Nautical Compass. We are engaged in fabricating and supplying a wide range of Navigational compasses replica to our client that is a type of a four needle, which is magnetized so that one end of the needle is always pointing towards the north pole and helps us in directing the exact locations. This compass is fabricated using exclusive grades of steel, brass with a wooden base.